What is Limiting Search Impression Share? One of the more commonly used competitive metrics; this provides you with a good idea of how many impressions are being missed. This is represented by a percentage between 0% and 100%, which represents how many, of the available impressions, that you have received. We have noticed that CPCs have a strong impact on impression share metrics, although not officially confirmed by Google in some specific cases low CPC’s will both; reduce impressions while maintaining a comparable impression share. 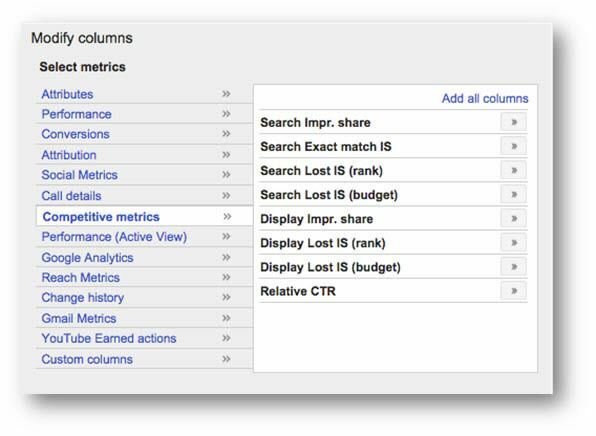 This is a valuable metric when trying to find opportunity within an account, for example; if you produce a report that looks at keywords with high value (conversions, revenue, ROI, etc) and segment this by search impression share. This can allow you to identify areas where there is high profit and the potential for greater exposure. If for example, you have campaigns running that are profitable and are missing out on impression share for any reason, these campaigns should be a high priority for you... Such campaigns are easier to scale up. There are typically two areas that limit Search Impression Share, both of which other guides in more detail cover, but which we summarise them here. If you ad exists on the second page on average or below the fold on the front page, your total impressions may be limited by the position / rank of your ads. This is more a symptom than a cause in many respects as CPC’s and Quality score dictate your ads rank / position. If a campaign runs out of budget, the ads contained therein will not be eligible to show for some of the time, this will again limit your Search Impression Share.